Where are you from? Your profession? I am a Jacksonville native and professional fine artist specializing in large scale watercolors of our state’s natural surroundings. When and how did you become interested in paddling? I come from a “water family.” Growing up, we spent time together canoeing, water skiing, swimming, fishing, sailing and windsurfing. Now my two brothers and I share our family lake house on Little Lake Santa Fe where we have lots of water toys, kayaks, paddle boards, canoes, and sailboats. My kayaking interest was sparked in college while going on whitewater rivers in Georgia and North Carolina. After graduation, I bartered a painting for my very first kayak - one for the flat waters of Florida, though, not whitewater. 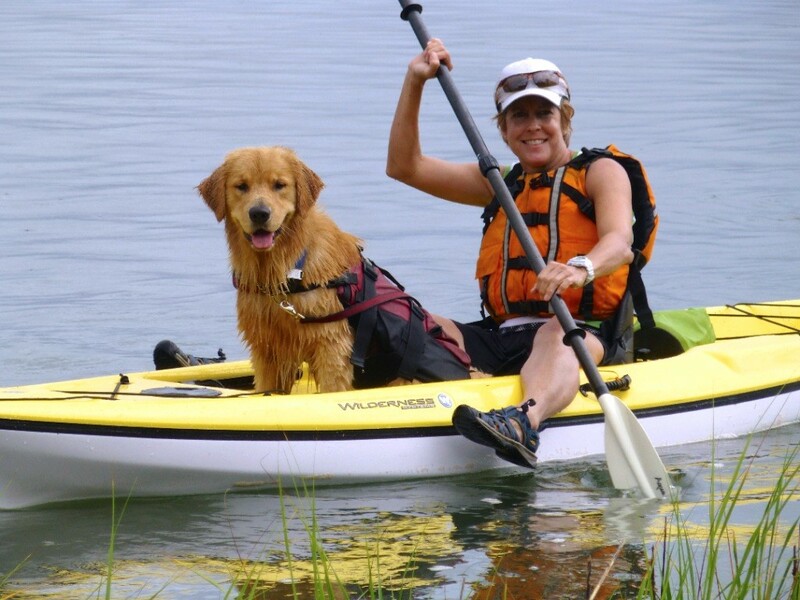 I’ve collected four kayaks now and my favorite is a sit-on-top that has a flat foot area where my golden retriever, Tanner, can comfortably ride with me. He adds to the enjoyment and adventure of any paddle. Where is your favorite place to paddle? I always enjoy canoe camping on the St. Marys River. Pulling over onto a random wide sand bar to camp overnight is pretty awesome. I also love the beauty of the Silver River and have painted several paintings from paddling trips there. The Santa Fe and Suwannee Rivers are always fun too. From my neighborhood I have several access points to the St. Johns River and Ortega River, so that is always fun. The Jacksonville area has a lot of nice places to paddle in fresh, brackish, and salt water. So, I guess I don't have one favorite. I just really enjoy being on the water and exploring new areas. Tell us about your book and art project which features North Florida parks and waterways. In 2017 I published a book The Wilderness of North Florida’s Parks, which is a unique blend of art, education, history, and community. It has 19 of my large scale landscape paintings of our area’s extensive park system and 60 parks are featured with sketchbook journal page entries about them. I designed it to be a resource, guide, and handbook, as well as a tribute to the great unspoiled stretches of my region. There’s a corresponding traveling art exhibit of the project to inspire people to visit these special places. I intend to continue painting more Florida landscapes, and trips with Paddle Florida are a great way to research new subject matter. Maybe another book and exhibit will come soon…. What's the most interesting thing that ever happened to you on a paddling trip? No thrilling story to tell, but what keeps bringing me back to the water for a paddle is just getting outside, spotting wildlife, and discovering the next painting to paint. Can you describe a Paddle Florida trip highlight? It might not sound like a highlight, but on my first and only (so far) Paddle Florida trip on the Withlacoochee River it was unseasonably cold for several nights. I now know I can camp in weather as cold as 27 degrees! Brrrr!!! I was nervous about the temperature drop but came prepared with lots of warm layers and a warm sleeping bag. I gained a new found appreciation for those activated charcoal hand, foot, and body warmers. Don't skimp on bringing those little but helpful heat generators. Fortunately, the days were perfect for kayaking. What advice do you have for folks considering a Paddle Florida trip? If you’re concerned about safety on these trips, be assured the volunteer guides who lead each day’s paddle are impressive. On the Withlacoochee trip, they “MacGyvered” a patch for a hole punched into a kayak, helped people make it over or around tree falls, and expertly helped someone get back in their boat when they tipped over in open water. And best of all, they knew where they were going on the river!